Fifty years ago today, on June 3, 1962, the art community in Atlanta was forever changed. After a three week trip to Europe, members of the Atlanta Art Association were returning home to Atlanta on a chartered plane. The plane crashed on takeoff, killing all but two stewardesses. At the time, it was the worst single plane crash in history. “It was the Titanic of our city. 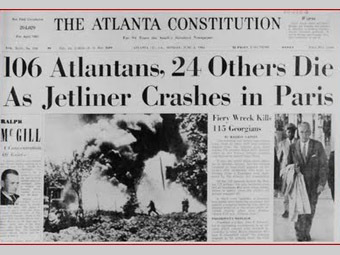 When it happened, it took a lot of leaders, important people at the time.” says Ann Uhry Abrams, author of “Explosion at Orly, The Disaster that Transformed Atlanta”. The group included artists, civic leaders, heads of businesses, overall, an influential group. They had traveled to Europe partly for pleasure, but also to show the city had a commitment to culture. Out of this grief, the citizens of Atlanta realized something needed to be done to memorialize the crash victims. They knew the tiny museum located in an old house needed to be improved. Ground was broken on the fourth anniversary of the crash for the Memorial Arts Center. 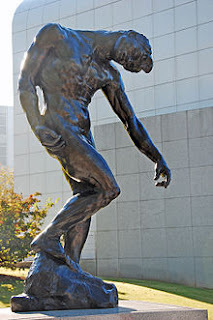 It opened in 1968, and was the first arts center that housed both visual and performing arts in the same venue, which included the Atlanta College of Art (now part of SCAD, Savannah College of Art and Design), The Atlanta Symphony Orchestra and the High Museum of Art. The Alliance Theatre was added in 1970, and in 2005 Young Audiences was added. This addition ensures the PreK-12 programs will serve more than one million children annually, the largest base of an arts center in the country. It was renamed the Woodruff Arts Center in 1982 to honor the great benefactor, Robert W. Woodruff, also known in Atlanta as Mr. Anonymous. The French government donated Rodin’s “The Shade” to the High Museum in memory of the crash victims. It now stands outside with the names of all the victims surrounding it. The crash victims had seen Whistler’s Mother at the Louvre, In a gesture of goodwill, the Louvre loaned the painting to the museum in the fall of 1962 – it’s first appearance in the US. Martin Luther King and Harry Belafonte cancelled a sit-in in downtown Atlanta as a concilliatory gesture for the grieving families. Andy Warhol painted his first “disaster painting” 129 Die in Jet, based on the cover of the New York Mirror the day after the crash. The High Museum is named for the High family that donated their home to the museum in 1926. This entry was posted in Around Atlanta on June 3, 2012 by vickiemartin.